This post covers three trails that were part of the BHCC 2013: (1) Jake; (2) Iceman; and (3) Full Size. Each trail required most of a day and was located several miles from the main camp at Wild Bill’s near Deadwood. I am only going to discuss the relationship between the geology and the off-roading experience today. The maps below are approximately the same region; the projections are different so they don’t match exactly but I have labeled important locations that are shown in later photos. The star indicates the location of the campground where the event activities and camping were located. 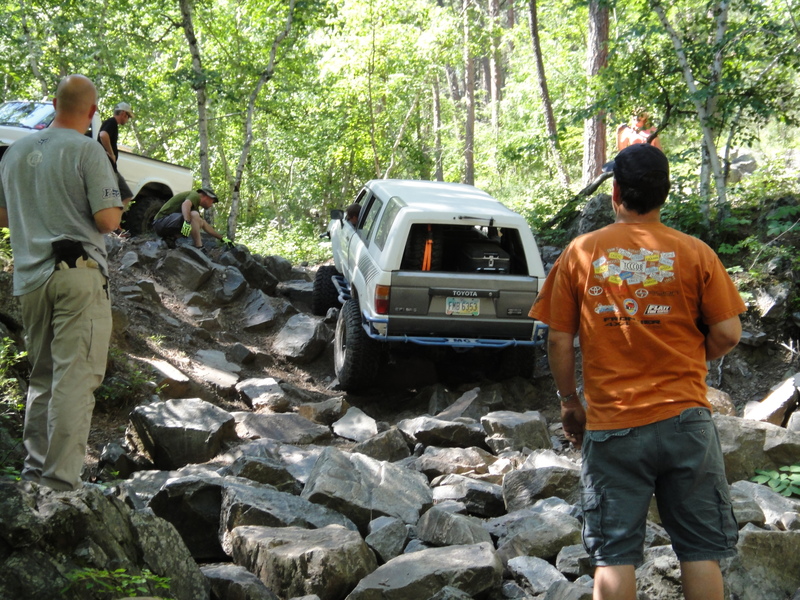 Unlike some events, this one occurred in a national forest instead of an ORV (Off-Road Vehicle) park. Wild Bill’s is at the top of a long climb up from the mineralized zone around Lead and Deadwood. Many faults and dikes are visible in these roadcuts. This image shows 30 MA dikes (light colored) along bedding/structural weaknesses in >2 GA metasediments, which hit the angular unconformity at the Great Unconformity that separates ~1.5 GA rocks from 600 MA rocks. These Cambrian sediments are not metamorphic (no great heat or pressure) and they are nearly flat; the hot molten magma turns horizontal to follow their bedding surfaces. Before hitting the trails, I drove south to Harney Peak and hiked to the fire tower at the top (~7300 feet). This is the backbone of the Harney Granite that was intruded ~1.6 GA. This image shows the trail and the overall shape of the pluton. 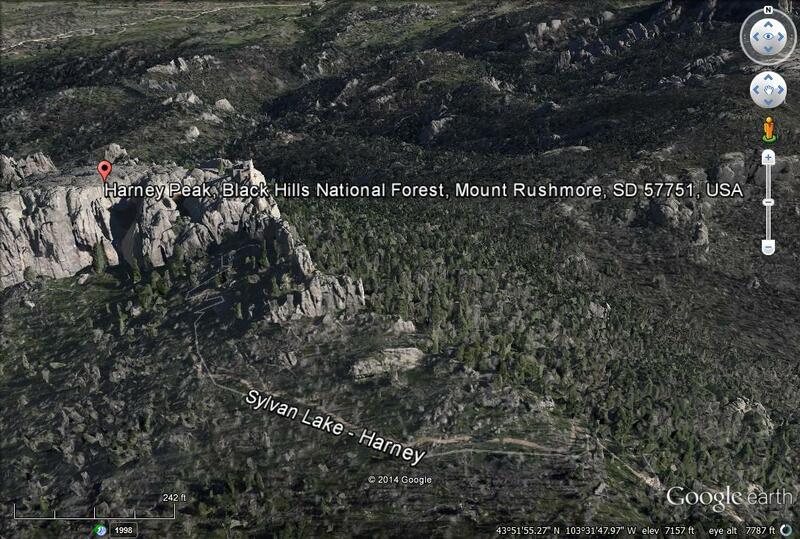 The fire tower is above the word “Black” in the GoogleEarth image. 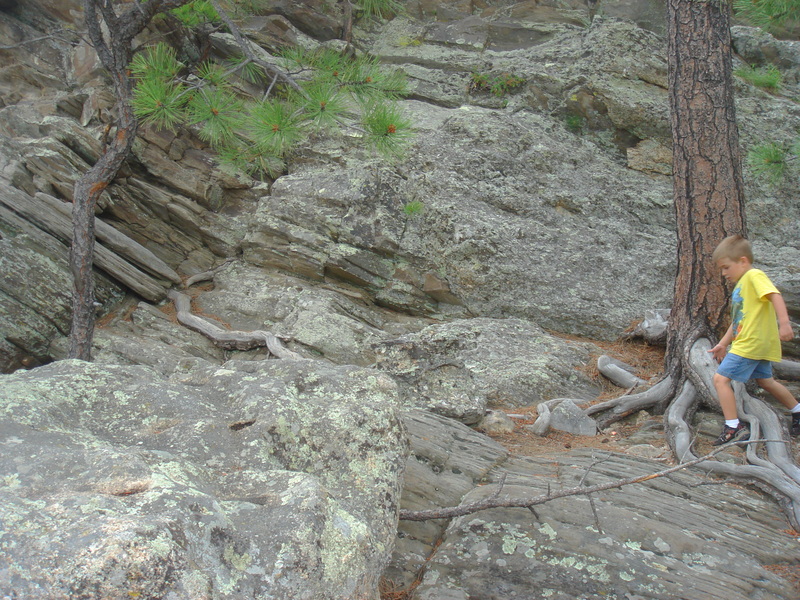 The complex relationships between the surrounding metasedimentary rock and the Harney Granite are seen in this image from the Mt. Rushmore monument. The first trail we followed was Jake (see image above). We drove into the pC metamorphic rocks and followed a forest service trail to a narrow gully that began climbing to the east. These rocks were originally deposited as mud/sand in nearshore environments like Louisiana ~2.3 GA and were buried. 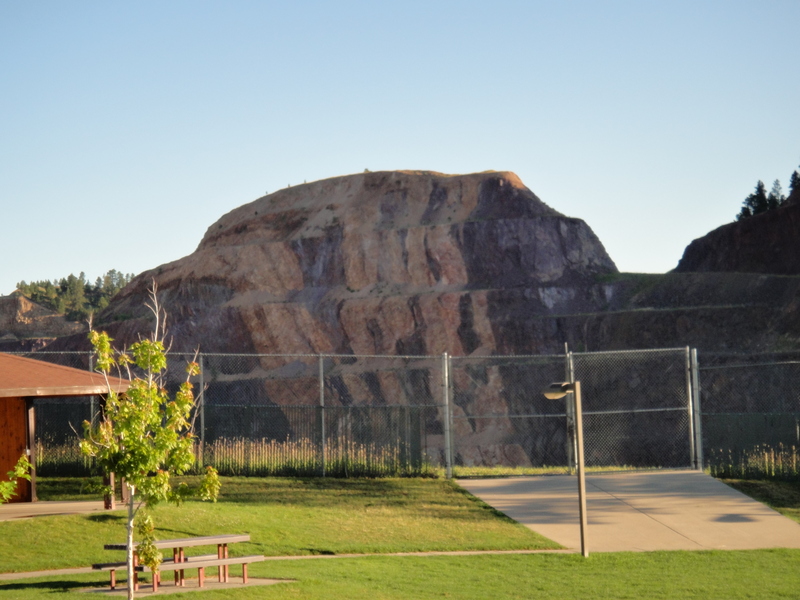 At ~1.5 GA the Harney Granite was emplaced (over tens of millions of years) and they were warped during the coeval orogeny. This occurred at about 8 miles below the surface. When they were uplifted at ~30 MA, they fractured into a common hexagonal fracture pattern that leaves their edges like knives. They are also very dense because of the high pressure. They form a truly tiring trail that sliced my aluminum wheels like butter.